QR codes allow people to go directly to your Facebook Business Page. Your visitors simply use their mobile devices to scan the QR code and are immediately sent to your Page. This eliminates the need to type any URL into a browser on their mobile phones. Keep in mind that this won’t work for custom tabs because custom tabs won’t display in Facebook’s mobile apps. 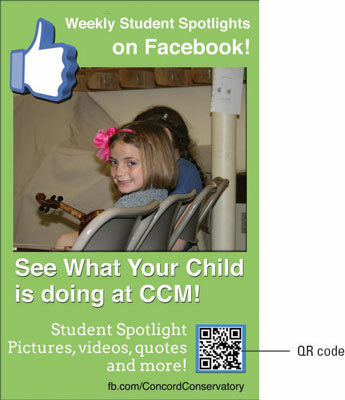 Here is a poster for a community music school in Concord, Massachusetts, that has a QR code driving traffic to its Facebook Page. Note how the school creates an obvious incentive for people to connect with them on Facebook. You can use many great free and paid resources to create QR codes, including bitly, a popular URL shortener (it’s great for Twitter users) that also allows you to create QR codes for free. Paste the URL of your Page into the text box at bitly.com. When bitly returns your shortened URL, copy and paste it into a new browser tab and add .qr to the end of the shortened URL. In your browser window, bitly creates a unique QR code for your Page. Right-click the QR code and save it to your desktop.